Traffic congestion and increased fuel costs have become part of daily life for the average motorist. However these are more likely to get worse as oil supplies become depleted and economic growth in the globalised economy drives an inexorable increase in transport use. Meanwhile, securing oil supplies has been a major cause of international unrest as developed economies attempt to secure supplies from unstable countries, requiring more public funding on military expenditure. For the environmentalist rarely a day passes without dire predictions of the effect of climate change on weather extremes, agriculture yields, ecological disaster or sea levels. A recent report by NASA estimates that road transport is responsible for 50% of the net short term radiative forcing leading to global warming. Meanwhile urban populations are still subject to pollution levels from petroleum fuelled traffic, these regularly exceed recommended levels causing an increased chance of a range of chronic illnesses and leading to a drain on health services. Wherever your priorities lie, it is unquestionable that we can’t continue to rely on hydrocarbon based fuels for transport, and the need for alternative energy sources is imminent. Unfortunately, transportation research and government policy aspirations have been dogged with unambitious and one-dimensional thinking. Examples of this include a straight swap of internal combustion engines for electric powered vehicles, or replacing private cars with public transport, or road with rail freight. Although these technologies can be made to work; to be desirable, economic and effective they must be transformed into a flexible and competitive mode of transport fit for the 21st century. This site focuses on how innovative techniques can be used to provide practical transport and environmental solutions without restricting convenience, business competitiveness or mobility. Reducing our use of petroleum and carbon emissions requires fundamental changes in the way we both travel and use motorised transport. Whilst technological advances might allow vehicles to become more fuel efficient and use cleaner and more reliable energy sources, on our present course these initiatives will be overwhelmed by the sheer increase in global transport use. This is driven by the vast increase in middle class households especially in the developing world. It is estimated that there will be 10 times as many people living in the year 2050 than there are cars on the road today, and using our present economic paradigm, all these people will be encouraged to consume excessively, in pursuit of economic growth. Whilst alternative technologies such as electric vehicles powered from renewable energy sources provide a route to a more sustainable culture, they are likely to remain limited to niche applications unless they can be manufactured and operated environmentally and economically. On the other hand idealistic notions of radical technological rejection are likely to be met with ridicule by the majority of people, and will more likely hinder rather than encourage our change to a sustainable culture. On this site we examine realistic and practical measures we can use to minimise our petroleum use without compromising mobility or flexibility. Whilst the use of some new technologies are proposed, these are used in conjunction with more prosaic methods of application which could be used relatively quickly without the risks of fundamental technological developments which might never mature. This requires a paradigm change of thinking away from our isolated concepts of private transportation. There needs to be a focus on the technologies and concepts that can produce real sustainability in transport, since there are fundamental limits what can be achieved whilst still retaining large fossil fuelled vehicles. 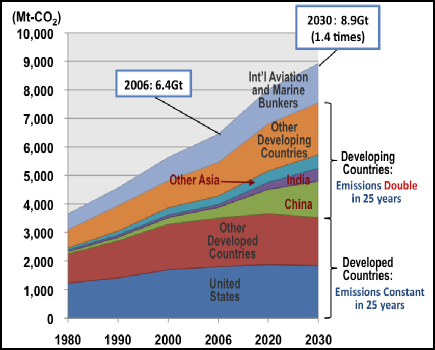 Only by either radically reducing their size, sharing journeys, or by transferring the energy source back to stationary low carbon sources can large reductions in carbon be realistically achieved. Dynamic Ridesharing - Our public transport system needs to be radically overhauled, since it can’t deliver significant environmental benefits or a cost and time competitive service compared with the car outside metropolitan areas. However, private car journeys due to their high frequency and diverse nature could easily be transformed into an environmentally advantageous, flexible and efficient public transport service by coordinating how drivers and passengers travel together. This concept is called Coordinated Shared Transport (COAST). Much smaller vehicles for short trips - Modern cars have become far too large and complex for short journeys and they are often used to carry only one person. This means the volume inside the vehicle is typically 100 times greater and the weight 20 times greater than the driver it carries. This is a grossly inefficient method of transporting people both environmentally and logistically. Much smaller vehicles could be used to attain a much cheaper mode of travel with very low environmental impact. However, to be commercially attractive, a method of traffic priority must be provided for such vehicles via extra lanes, special access points and underpasses providing a comprehensive parallel road infrastructure. 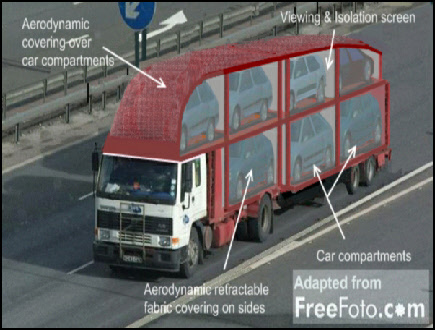 These would allow them to by-pass traffic jams and bottle-necks so drivers can achieve reduced journey times relative to those driving larger vehicles. 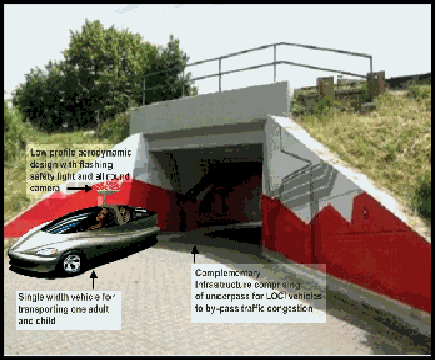 This system is called the Low Profile Vehicle with Complimentary infrastructure (LOCI) and is shown in figure 3. Integrated Infrastructure to assist electrification - Whilst conventionally sized electric cars have the potential to solve many environmental problems they still lack the range to cover many journey's. A car ferrying and charging system could provide a means to extend the range of conventionally sized cars for longer journeys without increasing emissions, net fuel consumption or resorting to the use of extortionately expensive batteries in the cars. This concept is called the Electric Car Transporter (ELECAT) and is illustrated in figure 4. This ferrying system could also pay for itself by avoiding the need to build extra highways and allowing drivers to utilise their time more efficiently during the journey. For freight, dedicated tracks could be built, or possibly parts of the disused rail network could be modified, to accommodate electric powered trucks and buses enabling them to be charged in transit and thereby extending their range. The use of a track would take heavy traffic off the roads and allow them to carry multiple trailers, thereby combining the logistical flexibility of road transport with the environmental benefits of heavier loads and electric power. 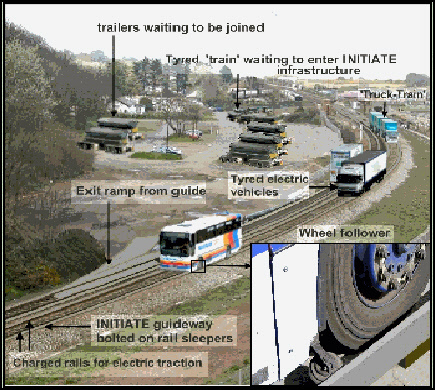 This concept is called the Integrated Infrastructure for Road and Rail Transport using Electrification (INITIATE) shown in figure 5.